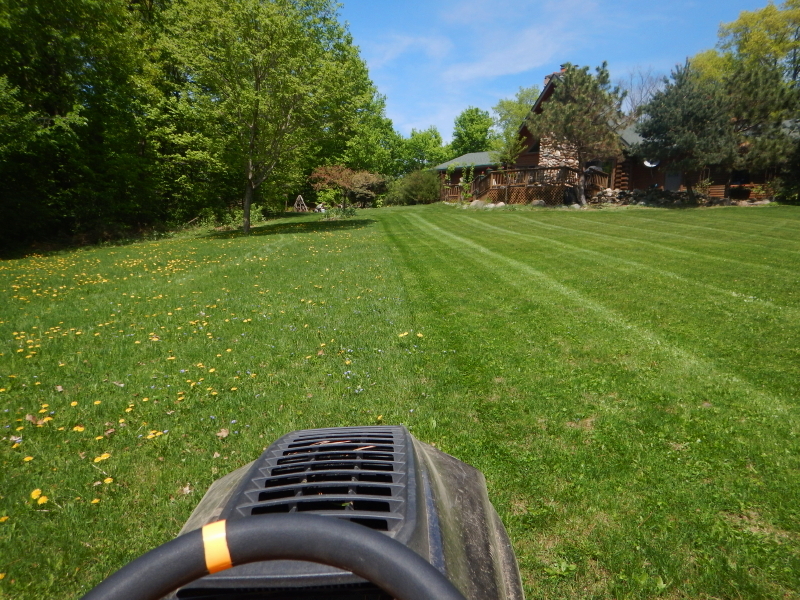 Last fall I bought a new yard tractor to mow grass. It’s a level up from the model we took on from the previous property owners, with a much sturdier mowing deck and improved steering. Now that I’ve had an opportunity to use it a couple of times, I’m able to judge its worth. Performance is improved in all areas except one. Despite the inclusion of hose fittings to wash the underside of the deck with water, it collects grass and needs cleaning just the same as the previous one. Since it was new, I decided to give the suggested water cleaning steps a chance, despite everything I’ve heard debunking the method. It just seems wrong to be getting the nooks and crannies of metal parts wet. The results were as underwhelming as I’d expected. Having mastered removing the deck for cleaning on the old mower, I figured it would be just as easy on this one, allowing me to turn it over to see the results directly. In total neglect of checking any instructions, I boldly forged ahead to remove clips at the attachment points. Right away I realized, there was no handy lever to release tension on the belt. That didn’t stop me from getting it apart, but I knew it was going to complicate getting it all hooked up again after I was done. Flipping the deck quickly revealed the gross limitations of the water method for cleaning. That might work if all you did was cut a short length of grass blades from a lush lawn. My reality involves a lot more weeds, small branches, dirt, and dust, combined with occasional areas of thick, too-long grass which packs on a complex brick of debris to the underside of the deck. The sprayed water didn’t come close to being effective enough. When it came time to reattach the deck, I made multiple futile attempts before finally wrestling all the clips in place at all the attachment points. All that remained was to get the belt over the pulley. No matter what contortion of positions I tried, I didn’t have enough hands or leverage to muscle that belt in place. I knew there must be a logical procedure I wasn’t figuring out. Yeah. This is the part where I went inside and consulted the manual again. Surprise! There is a little square hole on the arm of the tensioning pulley intended for the post of a ratchet driver that would allow for enough leverage to get the belt over the engine pulley. Brilliant. Why didn’t I think of that? I also learned that I had removed two clips too many, which complicated the task unnecessarily. So, cleaning the deck ends up being the same result as the old yard tractor, but properly informed, it will ultimately involve an easier process of removal and re-attachment. Overall, I’m happy to report being very satisfied with the upgrade! Good morning John, When you are only mowing a city lot the spigot on the mower deck work very good. 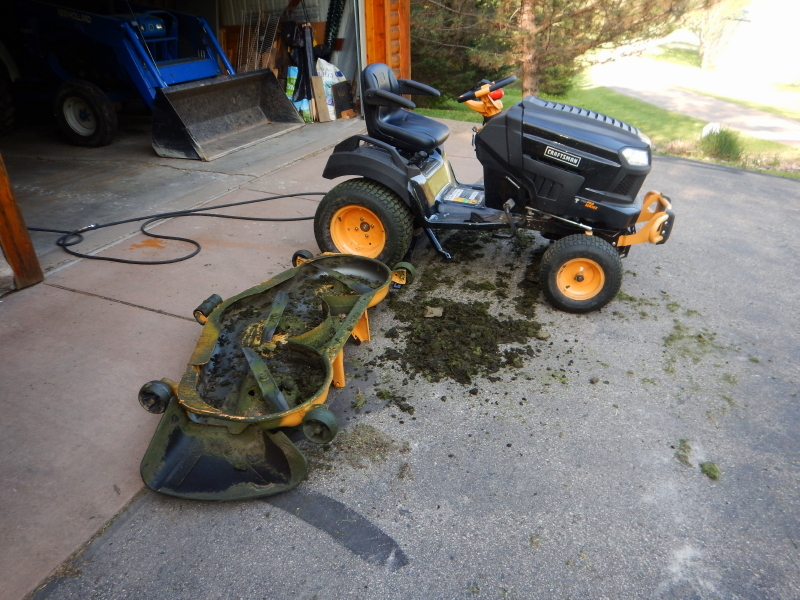 But when I was mowing an acreage, I had to raise the deck to it’s highest setting, drive the mower up on car ramps and reach under with a putty knife. I do see that Mill’s Fleet Farm is now selling a hydraulic lift for lawn tractors ($140) that looks like it might raise it high enough to clean the deck with a pressure washer. Might be easier than removing the deck each time. Just a thought, have a great day! I’ve actually surprised myself with how small an effort it has taken me to master a quick detach of the deck. Now, knowing how to properly do it on this new one, it seems even easier than ever. A hydraulic lift is tempting, though. Thanks for your insights, Steve!